This second page of plushes & toys features more modern additions to the line. 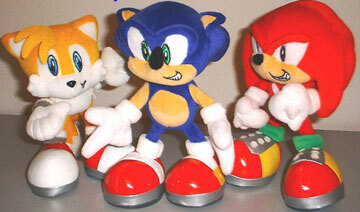 As plushes continued to be made in the USA, the designs improved somewhat, and other characters began to be featured. It's still nothing on the level of Japan, but they're definately something to see. Toy Island made a little-known line of Sonic Adventure 1 plushes. These had a REALLY limited release, and lasted a very short time on the market. The shoes are composed of a shiny plastic material, and their eyes seem to be embroidered on. The construction is fairly good, with Knuckles & Tails slightly better than the Sonic. Someone's plush collection. They have the Japan "Pale Sonic" and some bendies, but the notable thing in the picture is the Sonic who is wearing the tiny "Sonic & Knuckles" symbol shirt. 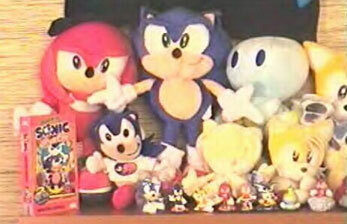 Not many plushes were produced in the "Sonic & Knuckles" era, despite the greatness of the game. This is a "Bigfoot Doll". It isn't really known who makes it, and it is currently available on Ebay auctions. It is likely that they are coming out of China somewhere. They are being distributed into the USA and sold from there as well, so it's kind of hard to pin these guys down. A few large "auction brokers" will sell them. But *Watch Out* the shipping costs they charge is often astronomical. This is to ensure they are paid well for the item, even if it is not bid up very high. Look CAREFULLY before you bid on this. Another store has begun to sell these. Go to www.videogamefigures.com to possibly pick one up. Use caution though, as this store sells out of things. These are promotional give-away dolls from Denny's Restaurants in the USA. It is one of the few (4 known) Sonic Underground related items. What's so "Underground" about him? They added a tiny guitar shaped 'patch' as a hang tag around his neck, and wrote the word 'underground' on his tag. Whee. Knuckles here is still in the bag, and he has nothing at all related to Underground about him, except the paper tag. He was in the show for ONE episode because Underground likes to ignore Sega. That's why. A collector's doll shelf. This has a nice mix of new and old plushes. The Big the Cat and Chao were available through mail order from Japan when Sonic Adventure 1 came out. They were fairly reasonably priced then, but fetch huge prices on Ebay Auctions now. This is not a fake scene or mini-diorama. These plushes are ACTUALLY that size, and they're shown in a real human house. 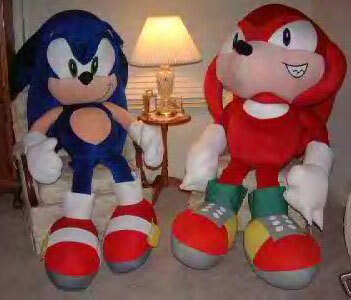 These have to be the largest Sonic and Knuckles plushes ever made! Aren't they great? Yeah, they'd take up your whole house if you owned them, but who doesn't want a Sonic as big as you are? 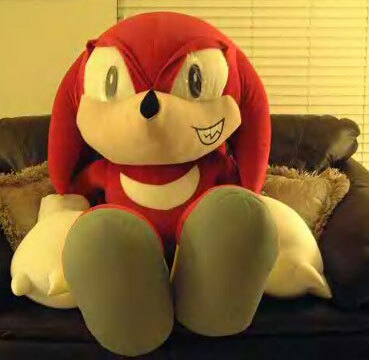 The construction seems good too, although Knuckles looks slightly...crazed? Still, these would be awesome to own. So you say you've got space? Want to own these guys? Well you can! They are available on Ebay fairly frequently. www.toywiz.com USED to sell them, but they apparently stopped. If we get any new leads for PERMENENT retailers, the link will appear here. They are (naturally) somewhat expensive due to their size, but it's definately worth a look. 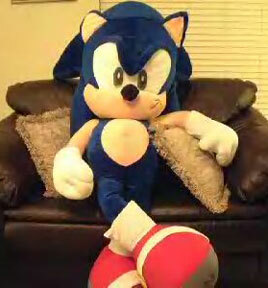 Giant Sonic is relaxing, and Giant Knuckles is looking very....eager? This is a slightly more current Tails. Look at his forelock /bangs, they're individual sewn 'hairs' which gives him a rather Rasta look. This one IS orange though, which is a marked improvement. He has the same plastic button nose as a Sonic on the previous page, but they were not together. This one was also available at SegaWorld London and through a form in STC. 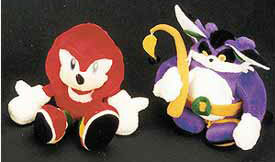 A better shot of the Sonic Adventure 1 Big the Cat and Knuckles. Big looks squished. A Rouge the Bat doll. Where is this from? Not sure if it's American or not, but here it is. Looks well constructed with nice big wings, accurate expression and nice details on her clothes. 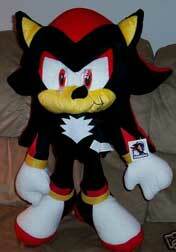 Everyone loves Rouge, so expect this plush to be expensive. 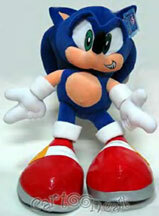 A company called Toy Network made Sonic Adventure plushes which were not that large. They did more than just Amy Rose, but a lot of those got into the Mutant Gear page. 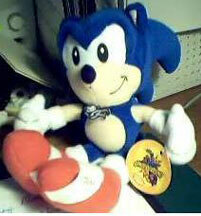 Toy Island produced a separate Sonic plush that was wired inside. This caused it to be poseable however you'd like, kind of like a plushie bendy toy. They too, were only avialable in an extremely limited way, and for a short time. This one was being sold by "World Securities" on Ebay. You can still find a few of these kicking about. Need more giant plushes? This Shadow one will help your collection! This is a Toy Network Shadow, standing on a real-size sofa. Look how big it is! Although it isn't as large as the above Sonic and Knuckles, it's still a great thing to have for your home. Wonder how much it might cost...Or where you can get it? They're at Kings Dominion in Virginia USA, and there, they are about $60.00 each. Price info by Super Silver. Here are more Giant Shadows. These come from Kings Dominion in Virginia. It is like an amusement-park, and you can win him. It looks to be by Toy Network again, in yet another big size. These should be around 2ft high, standing. It talks! 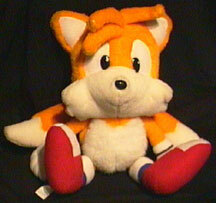 This is the 2nd talking plush from the USA, but it's had a Sonic X makeover and is far less fuzzy. It is also less cute. With bent down ears, frowny mouth, somewhat misplaced plastic eyes and shrivelled hands...they need to try a bit harder for accuracy. He says: "Ready champ? Let's go!" Credit to Flare the Hedgehog for the photo. Here's a different Big the Cat. Notice the color of his buckle is now yellow and not green. He has his fishing rod and belt details, and his floppy ears almost make him cute. The eyes are plastic on this one, and he's pretty darn accurate as well. What does it look like from the back? See more Sonic the Hedgehog Plushes on Page 3!